We previewed the 2014 Fiat 500e this morning, and now we can bring you live photos from the 2012 Los Angeles Auto Show. The diminutive electric city car might not be beloved within the company, but there's still a lot to like about it. In bright orange, Fiat and Chrysler's compliance car certainly looks the part, its retro styling giving little away about the powertrain lurking within. Only some unique wheels, white painted front and rear bumper sections, and a sporty body kit mark it out as something special. Inside, it's largely standard 500 too--but a digital display replaces the standard dials in the instrument binnacle. Power comes from an 83 kilowatt (111-horsepower) electric motor, and it uses a 24 kilowatt-hour lithium-ion battery pack. Fiat revealed at the show that city range is expected to be over 100 miles, and over 80 miles at highway speeds. A full charge from a 240V level 2 charging station should take around 4 hours. 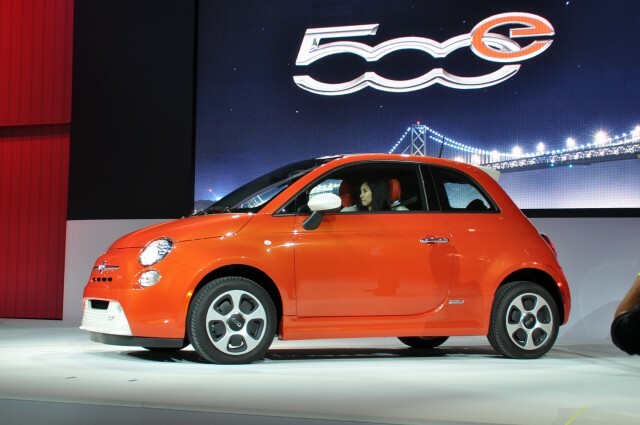 You can find out more about the 2014 Fiat 500e in our earlier preview. In the meantime, keep your eyes peeled for more information from the show. Bookmark our dedicated show page to get all the latest images and info from L.A.